Any event planner will tell you that coordinating a successful event is all about the numbers. How many people can a particular venue hold? What kind of incentives should you provide? How many parking spaces, press releases and paid promotions will it take to make sure everything runs smoothly? Finding answers to these questions and more can make hosting even a small event a nerve-racking experience. But imagine hosting an event for nearly 500 people, outdoors, in the middle of July, at a commercial nursery where Spanish is the common tongue. 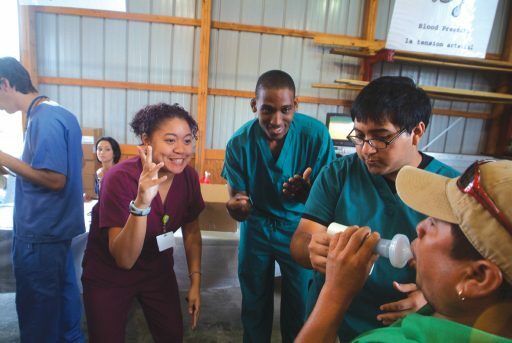 Where half of the attendees are farmworkers and day laborers, and the other half are doctors and researchers working alongside students, nurses and volunteers to provide free health screenings and conduct community health research. If it sounds overwhelming, that’s because it is. But that hasn’t stopped Augusta University and community partner Costa Farms from hosting the Costa Layman Health Fair, a comprehensive worksite health fair and research opportunity, for more than a decade. Because over the course of the last 10 years, the health fair’s coordinators have learned that while hosting a successful event might be all about the numbers, hosting one with the power to change lives is all about the people. Since its inception in 2005, the Costa Layman Health Fair has served two major functions for both the university and the farmworker community. 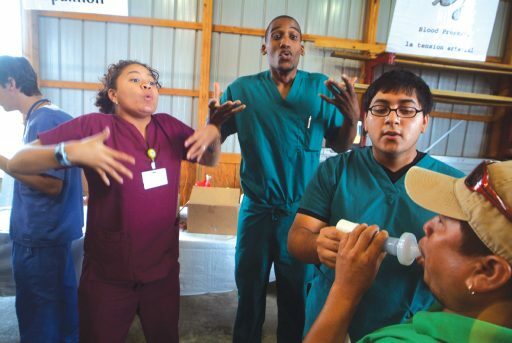 In addition to providing meaningful outreach training for students from the College of Nursing, the College of Allied Health Sciences and The Dental College of Georgia through the Costa Layman Community Outreach Program, the fair has also helped to engage Costa Layman employees, many of whom are Hispanic farmworkers, in health care awareness, health promotion and disease prevention. Both fronts have proven tremendously successful. But it’s the newest opportunity – interdisciplinary research – that has the university’s health sciences educators most excited. Dr. Andrew Mazzoli, director of the university’s Respiratory Therapy Program, has been involved with the Costa Layman Health Fair since 2009. Together with Debbie Layman, a College of Nursing alumna and former Costa manager, and Dr. Pam Cromer, associate professor of biobehavioral nursing, he was one of the first to propose adding a research component. The first step was getting approval from the Institutional Review Board. Cromer said overcoming the language barrier was a primary concern. “There are a lot of distractions out here,” he said. Set up under the corrugated steel roof of an open-air loading platform, said distractions are easy enough to find. But location isn’t the only limiting factor. Despite the chaos, fair attendees come away with newfound clarity about their health and well-being. Mazzoli and a team of students from the Respiratory Therapy Program spent the morning performing pulmonary function tests and obstructive sleep apnea screenings. Of the farmworkers they tested, more than 15 percent were referred for further evaluation. The figure represents a huge impact on patient quality of life. That, according to Mazzoli, is something that can’t be measured. While crucial to understanding the health needs of the farmworkers as a whole, the information Mazzoli and his team collected represents only a fraction of the data gathered. 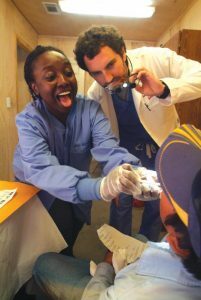 In addition to respiratory health screenings, teams from the College of Nursing, the College of Allied Health Sciences and The Dental College of Georgia provided a number of free examinations, including dental screenings, HIV testing, heel bone density, carpal tunnel and dermatological screenings as well as various tests for visual impairment. Cromer and her team, comprised of Clinical Nurse Leader students and College of Nursing alumni, spent the morning collecting data on various cardiometabolic risk factors. Over the years, Cromer and her team have gathered data from hundreds of patients as part of the ongoing Cardiometabolic Risks of Hispanic Farmworkers in Southeast Georgia (CHARM) study. Led by Dr. Yanbin Dong, associate director of the Georgia Prevention Institute, the study serves a threefold purpose: to characterize long-term progression of cardiac and other metabolic risks, investigate for possible influences related to health risks and establish a biorepository for future studies with university-wide multidisciplinary collaboration. The information collected is troubling at best. Following the 2016 health fair, Cromer and her team found that vitamin D deficiency was the number one cardiometabolic risk factor among farmworkers (73 percent prevalence) with more than 85 percent of female workers testing positive for either vitamin D deficiency or insufficiency. The second biggest risk was obesity (71 percent), followed closely by hypertension (54 percent) and diabetes/prediabetes symptoms (53 percent). But Cromer doesn’t see it that way. Instead, she said, she and her team see opportunities in the figures. Opportunities to improve health care and health awareness for an at-risk population and opportunities to foster even more collaboration in the future. “We feel like everybody has a specialty, and if we can work together and learn from each other and use that skillset and that knowledge, then ultimately, the patient benefits,” Cromer said. While other physicians worked the fair in lab coats and scrubs, Dr. Jose Vazquez and his team at the HIV screening booth wore jeans and T-shirts. Together, they spent the morning manning the Augusta University Ryan White Program’s mobile HIV testing unit, providing free, confidential testing in the comfort of an air-conditioned mobile clinic. The casual dress was a conscious decision. Not because of the heat – a humid 91 degrees – but because of the community. Part of that discrepancy stems from a distrust of Western medicine. A 2012 Census Bureau report discovered that 72 percent of Hispanics refused to take prescription drugs. Another survey administered in Colorado in 2013 found that 45 percent preferred home remedies to formal care. Factors like communication barriers, lack of insurance, and pride also play into the equation. The end result, Vazquez said, is that many Hispanics – especially on the farm – receive care too late or not at all. Overcoming that struggle requires a certain level of understanding. Dressing casually and, in the process, removing the stigma of seeing “the doctor” is only one example. Another is bringing the care to the people. The extra effort makes a difference. Despite the cameras and the commotion, it isn’t uncommon to find farmworkers grinning and trading friendly banter back and forth with their caregivers. But the work shines through in the form of research, as well. As for why many teams show up in greater numbers year after year, Mazzoli said it stems from a lesson he and his fellow professionals try to impart to students.